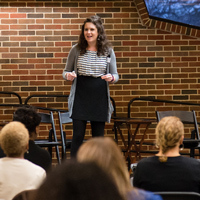 The 2019 Webster University Diversity & Inclusion conference will be held in on campus on Tuesday, Feb. 26 through Thursday, Feb. 28. Past conferences have featured a variety of learning formats including lectures, panel discussions, hands-on learning experiences and performances. Changes in format, time of day and location on campus are being made for the 2019 conference to take advantage of feedback received and broaden the scope and reach of the event. Rather than having two full days of sessions and lectures at the same location, events will be held over three partial days. Attendees include faculty, staff, students, alumni, corporate partners and community members from around the St. Louis area. Topics at past conferences have included: hate speech, unconscious bias, gender in the media, how to be a transgender ally, multigenerational workforces, accessibility issues and immigrant experiences. For more information on past conferences, please visit the Conference History section of our website. Faculty, staff, students and members of the community are invited to submit proposals for presentations they’d be able to give at the upcoming event. Those interested in submitting a presentation idea are invited to visit the 2019 conference page on our website and follow the instructions on how to submit a proposal. Proposals are due by Oct. 15, 2018.